Belly Dance Events . . . a documentation of fascinating dance experiences. Bellydance and Pregnancy . . . articles relating belly dancing as preparation for childbirth and increasing women's self esteem. Belly Dance Costumes . . . advice on how to make belly dancing costumes. Spotlight on Belly Dancers and Issues . . . all ages and walks of life share their experiences with the art of belly dancing. Fun, Fantasy and Fiction . . . humor is always a good ingredient in belly dance. Belly Dance Notes, Credits and Articles . . . articles on choreography, Pharonic dance, producing and using instructional DVDs and videos, lessons and theory, photo credits . . .
Travel and Adventure . . . belly dance in Egypt, Dervishes in Turkey, Mendocino Music and Dance Camp, Costa Rican rain forest, also see documentation of events above. Self Empowerment . . . inspirational tools for personal growth. Belly Dance Video and Audio Reviews . 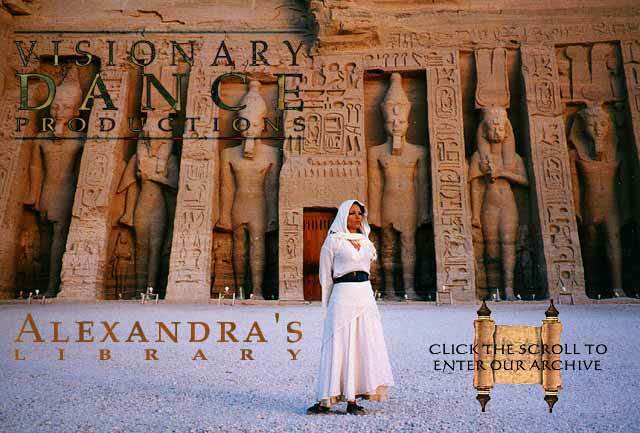 . . articles about Visionary Belly Dancing videos, DVDs and music productions. Happy Mail from Fans . . . satisfied customers write to us about our work, videos, DVDs, classes, retreats, web site, articles and other belly dance products. Web Books . . . these are fascinating and extensive web sites in their own right about related belly dance subjects and beyond.